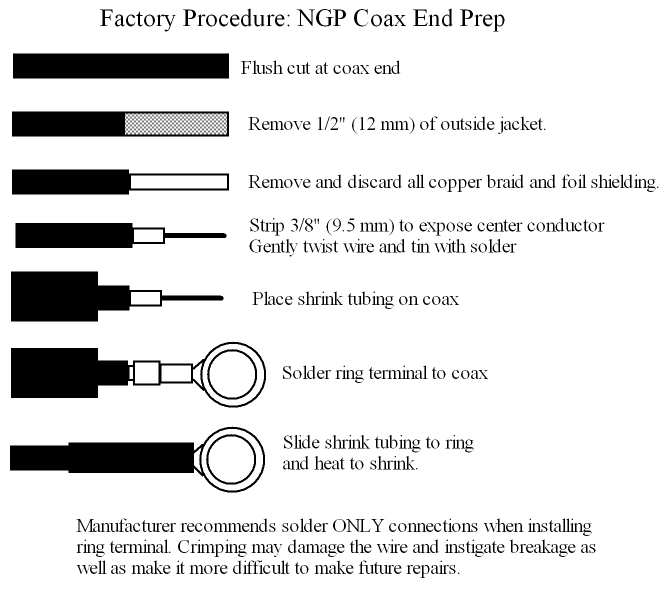 The NGP coax cable assembly is a tuned circuit so the length of the cable is extremely critical. In most cases, reducing the length of the assembly by as little as one-half inch (25mm) will, in all likelihood, render it useless. If the ring terminal became separated from the cable assembly and took with it the short wire end of the coax center lead, then the length has been altered and any reprocessing of the cable end may shift the resonant frequency enough that adjusting the system with the antenna may be impossible. On the other hand, if the ring terminal happened to break in such a way that the wire from the end of the coax was not broken or damaged, you can, with a little bit of patience and some common tools save the cable assembly from permanent damage. If the ring terminal was soldered on initially (the recommended method) then removal is easily accomplished by simply reheating the connection with a soldering iron and pulling the ring terminal off. Should the terminal be replaced at that point or at a later date, avoid using crimping tools. They are very damaging to the delicate center conductor wire of the NGP cable assembly. If you are faced with removing ring terminals that were either crimped on or, crimped and soldered special handling will be required. We have done it the few times it was attempted with a total success. The first thing you will want to do is remove any of the small pieces of tape or shrink tubing that was installed over the end of the ring terminal. With that gone, you will need to split the red ring terminal insulation sleeve from the terminal itself. Our preferred method is to use a small hobby saw to split the insulator lengthwise and then carefully peeled it away to gain access to the metal portion of the terminals metal sleeve. The same can be accomplished with an Exacto knife but it requires greater care to prevent accidentally cutting oneself with the sharp blade. The next step is to spread open the connection sleeve. When manufactured the sleeve is drawn up from two sides and where these sides meet the sleeve can be separated. How this appears in your instance will vary because it will depend on what type of crimping tool was used and how it was positioned on the sleeve when pressure was applied. You will either need to locate and separate the sleeves split edges or again, use a small hobby saw to split the sleeve so it can be separated and the wire extracted without damage. When reinstalling the ring terminal … DO NOT CRIMP … use solder only. We also suggest using a short piece of shrink tubing that will cover the end of the ring terminal and trimmed end of the coax cable. It is important that any loose ends of the removed shielding is kept from touching anything … one hair thin strand touching the wrong place and the system will not tune or operate properly.